Carol Whitehead is a garden designer and artist based in Seaford, East Sussex. Her requirement was a new website to replace the existing one, which was felt to be not working hard enough in terms of aesthetics, functionality or web presence. 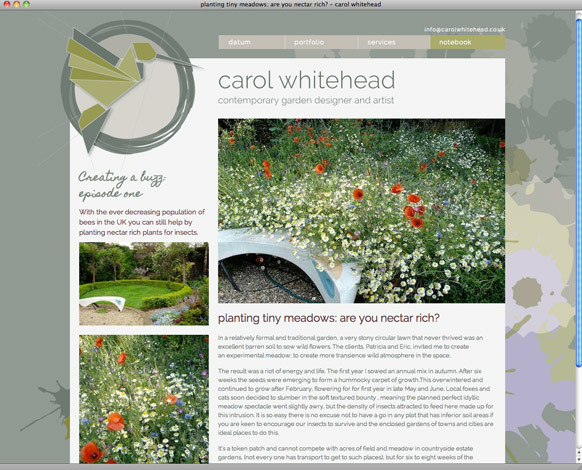 Carol is a real hands-on person and really liked the idea of getting to grips with a blogging style page where she could post regular updates on gardens in progress as well as imparting her knowledge and observations in the field as a whole. Designing her logo was a great exercise in balance; as an artist Carol had strong ideas about what she would like to include in the identity and the end result is a real honing down of the disciplines and characteristics she was hoping to convey. Inspiration from her love of Japanese art, the teachings of Aikido, and form and function in harmony; as well as paying homage to one of her favourite films of all time (and mine, incidentally). For the website, we decided to keep with the idea of case studies on a range of finished projects from her portfolio, but the beauty of WordPress is that we will easily be able to swap out some of the older projects as newer ones are complete, whilst still being able to keep them in the archive for reference. The notebook page (blog) has a slightly looser style than the others, to reflect the artistic side of Carol’s personality. She is looking forward to using this space as a testing ground for ideas and developing it further.